In light of President Obama's recent awarding of the Medal of Honor to former Staff Sargent Ryan Pitts for valor in Afghanistan & retroactively to a number of overlooked minority soldiers of former wars, Daniel Grotta explains why such a honor is relevant and important. Last week, in a solemn White House ceremony, President Obama awarded the Medal of Honor -- the nation's highest military honor -- to former Staff Sargent Ryan Pitts of New Hampshire, for bravery and valor under fire. Previously, the Medal was also retroactively awarded to a number of soldiers from WWII, Korea and Vietnam, who had been overlooked because they were members of minorities. While everyone has heard about the Medal of Honor, many don't really know its history or why it is so important. Author Daniel Grotta, a former war correspondent who also covered military traditions as well as the armaments industry, returned to the subject in recent years, while he was doing the research for his novella "Honor." In a videotaped interview for the Arts & Letters Show, Grotta explained some of the Medal of Honor's background. "The Medal of Honor was created by President Lincoln during the Civil War, to recognize the heroism and valor of men who excelled in deeds [in battle]," Daniel Grotta explained. "Only about 3,500 Medals of Honor have been awarded and considering that since the Civil War over 18 million Americans have been in uniform and served during a war... it is a highly unusual event...[to award the Medal of Honor]... for unusual heroism and valor." Daniel Grotta described Staff Sargent Pitts' act of bravery for which he was given the medal. "He was part of a small team... and they were attacked by ... the Taliban which outnumbered them many times over.... His position was about to be overrun but he continued to fight on, against overwhelming odds. He kept the enemy at bay, even though wounded, until reinforcements arrived. It was an act of unusual valor, putting his life at risk, trying to save his wounded friends." Daniel Grotta's novella "Honor" explores the human cost when patriotism, personal ethics and the deep bond of friendship collide. What is it to be honorable? In the eyes of others? In your own heart? Is it what you've done or who you are? Jeff Smith was, as his bully of a brother-in-law Gene Engelhardt was fond of retelling, "what the cat dragged in." 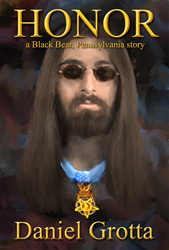 A scruffy, bearded hippie Gene’s sister Bonnie had met and fallen deeply in love with decades ago at a Washington peace rally against the Vietnam War. Even shaved and doing whatever the Engelhardts wanted, his in-laws never accepted or approved of Jeff. Now, Jeff is saddled with a family, a dead end job, and, after Bonnie died of cancer, a mountain of debt. Only Jeff has a secret and a unique possession that could possibly solve his financial problems and help his daughter realize her dream, if he can ever overcome the guilt and shame that has haunted him for over thirty years. "Honor" is currently being adapted into a theatrical play by the playwright David Zarko. The novella is available as a paperback and eBook from most bookstores, including Amazon. Daniel Grotta has worn just about every hat in publishing, including investigative journalist, war correspondent, syndicated columnist, editor and so forth. His thousands of articles, reviews and columns have appeared in major magazines, newspapers and online journals. He has also authored several books, including "J.R.R. Tolkien: Architect of Middle Earth," the renowned first biography of the creator of "The Lord of the Rings." Among Daniel Grotta's many accolades and awards is one that stands apart from the rest: His writings were, at one point, the most requested to be recorded as audio files by Reading for the Blind in Philadelphia, because of their visual clarity and beauty of his prose. A member of the National Book Critics Circle, Overseas Press Club, The Authors Guild and American Society of Journalists & Authors, Daniel Grotta is a frequent speaker at conferences and other events on writing, literary criticism and the publishing industry.